We love to celebrate holidays with symbolic foods. That’s why we’re seeing green as we welcome spring (have you heard the birds?!) and Passover simultaneously with this vegan and gluten-free pesto over spaghetti squash. But with earliest veggies like morels, mint and pea greens still 6-8 weeks away here in CT, we have to fudge how we source green foods a bit if we want to include them in our mid-April meals. Robin Selden of Marcia Selden Catering and Event Planning helped us green up with this Kale Raisin Pesto which includes an abundance of vitamin rich kale and parsley. It’s a great way to get back on track if you veer off towards carb- loading during the holiday (guilty). Robin is saucing spaghetti squash here so it’s a perfectly gluten-free and vegan dish for Passover lunches (chose vegan cheese or skip it) . Enjoy it year round over any spiralized veggies or your favorite pasta. NOTE: Consider Passover soy sauce a good substitute for worcestershire sauce during the holiday. This kale pesto is rich in vitamins and delicious over squash or any spiralized vegetables of choice. Pasta lovers, feel free to dress your pasta, of course. Cut the ends off the squash and halve lengthwise. Scrape out the innards and the seeds. Place on a greased sheet pan. Drizzle with extra virgin olive oil and sprinkle with salt + pepper. Roast for 40-50 minutes, let cool 10 minutes. With a fork, scrape the squash horizontally into strands that look like spaghetti. combine the hazelnuts, kale, parsley, garlic, raisins, evoo, water, cheese and Worcestershire in a blender and process until smooth. Add more water if needed to process. Heat the spaghetti squash and toss with pesto. 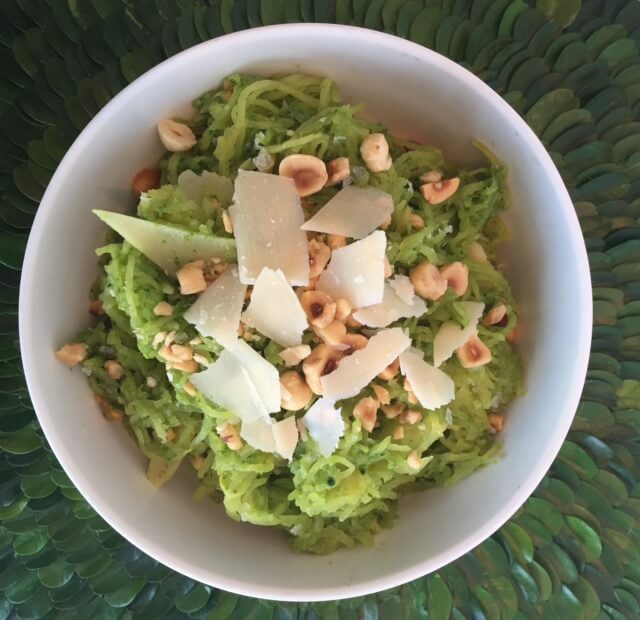 Place into a bowl and garnish with reserved 2 T shaved parmesan and ¼ C chopped hazelnuts. To make this recipe dairy free and vegan, considering using nutritional yeast in the pesto. For Passover, substitute kosher for Passover soy sauce for the worcestershire sauce.